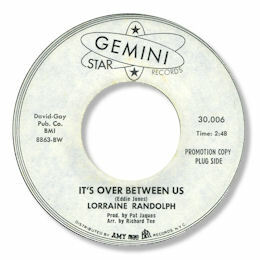 Hot on the heels of Eddie Jones original of "Let's Stop Fooling Ourselves" came this lovely cut by Lorraine Randolph. There are many deep fans who consider this to be the cream version thanks not just to the very fine arrangement from Richard Tee but also due to Lorraine's breathy, emotional reading of the heartbroken lyric. And I'm not sure I would argue with their view so compelling is her interpretation. In any event It's Over Between Us is a prime piece of balladry from New York - 5 stars without a doubt. I'm not aware of any other 45s by Ms Randolph - a real pity.